Its important for children to know how each letter in English alphabet sounds when each letter is spoken out individually or in a combination of several letters (forming a word). For example, a child may argue that if the word "do" is pronounced as "du" than the word "go" must also be pronounced as "gu" which is the not the case. But if a child is able to understand how each letter sounds than they will not have such a confusion. As you know there are 26 letters in English Alphabet like a,b,c,d,e,f..........upto...z. Just watch this youtube video and it will teach or make you aware of the phonics alphabet A-Z sounds for children. But this is not a fun way to learn things. There are certain toys that teach phonics alphabet in a fun and interactive way. Below are some of the best to be bought. I would say this is one of the best toys to enhance phonic skills of the child in an interactive way. First of all, this is a toy in the shape of a school bus. However the bus is not hollow (like a real bus) and its just a single flat piece representing only one side portion of the bus and shows only one window on that side. This window has a square shape but rounded from top and its magnetic in nature. Other than that there are 26 interactive letter tiles with one letter printed on each tile. These letter tiles are also magnetic in nature and exactly having the same shape as the shape of the window on the bus. 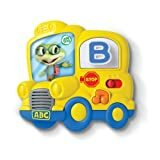 When each letter tile is placed or fixed into the window of the bus and pressed once, the toy speaks out the name and sound of that exact letter printed on the letter tile including short and long sounds for every vowel and that is how the child learn the phonics of the alphabet. But now once the tile has been fixed and pressed once, just press it again (2nd time) and the toy will utter a word starting with the letter printed on the tile. For example, if the letter is "D" than it will utter the word "driver". All the letter tiles can also be used at different places of the home as they stick to any magnetic surface. Basically a magnetic surface is one which is made from iron like fridge, iron cupboard, etc. There is also a button on the body of the bus below the window. With the help of this button three learning songs can be played including the "Alphabet Song" and "Wheels on the Bus.". Children can also sing and dance while listening to these songs. Here is a nice video showing the complete functioning of the toy. This toy is more attractive, interactive and bigger than the one mentioned above. It also has more options to explore things related to education. Basically its in the shape of a school bag with a handle on the top to carry it where ever you go. It is made from high quality plastic and there are two major portions of this bag. Its a real working kind of a bag where the first half is hollow from inside (storage case) and 30 letter tiles (provided along with this educational toy) can be inserted into them for "on the go" learning purpose. Second lower half of the bag is major interactive part which is used to create all the educational fun to learn names and sounds of 26 English alphabetical letters and various other things too. 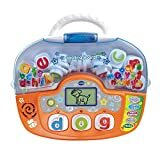 Second lower half has an animated LCD screen and below it are three different magnetic areas to insert 3 letter tiles at a time (instead of only 1 as in toy no.1 mentioned above). If one letter tile is inserted first in any one magnetic area, that letter name and sound (phonics) will be pronounced by a playful bee character in the LCD Screen and that is how the child or toddler will learn. If three letter tiles are inserted into three different magnetic areas provided, than it will make a 3 letter word and this word will be spelled by the bee character again in the LCD screen. Total 200 such 3 letter words can be learned from this educational toy set. But this is not all and there are four other press buttons on the right side in the lower half. Each button represents 4 different progressive learning options and those options are Phonics, Letter Order, Word Explorer and Super Speller. Each option has different function. For example, in the "letter order" option the child will have to fill the gap by placing a letter tile so that correct sequence of three letters is completed. Say it is : X _ Z. So child here has to fill the gap in between the two letters which is Y and this will complete the sequence in correct alphabetical order as XYZ. Here is a nice video to see this beautiful toy in action. Toy no.2 is more better option to buy as it can also be used on advanced level after pre-school when the child starts learning pronouncing 3 letter words.